Toxoplasma gondii is an intracellular, protozoan parasite that infects approximately one-third of the world population. The parasite can be acquired congenitally or through the ingestion of contaminated food or water. The immune response to T. gondii has been extensively studied over the past three decades. Acute infection with T. gondii leads to systemic disease that is largely controlled by the cytokine, IFN-g. Despite this, the parasite persists in several tissues, including the brain and retina, where an ongoing T cell-mediated immune response is necessary to limit parasite replication. The vast majority of infections are asymptomatic, but suppression of T cell function can lead to severe toxoplasmic encephalitis and/or retinochoroiditis. While the importance of T cells in controlling T. gondii in the brain and eye has been demonstrated, research in the Harris laboratory aims to identify factors within immune-privileged tissues that influence local resistance to T. gondii. Visualizing the immune response. The Harris lab utilizes various imaging techniques to visualize how the immune system functions in the brain. Multiphoton microscopy allows us to observe how immune cells behave in real time. One of our overarching goals is to understand how immune cell behavior is linked to function. As a postdoctoral researcher, Dr. Harris imaged CD8+ T cells in the brain, revealing the importance of chemokine-driven T cell migration in pathogen clearance. 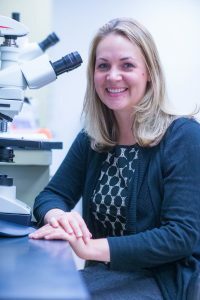 At the University of Virginia, Dr. Harris collaborated with colleagues in the Center for Brain Immunology and Glia (BIG) to visualize the recently described lymphatic vessels in the meninges. The lab continues to utilize this technique to understand how the behavior of regulatory T cells and microglia are associated with their function. In addition, the lab uses confocal microscopy to understand the geography of the immune response to T. gondii in the brain. With this powerful technique, the Harris lab aims to understand how focal immune responses are generated. The left-hand image depicts Foxp3+GFP-expressing cells (green) in contact with CD11c-YFP expressing cells (yellow) in the brains of live T. gondii-infected mice. Blood flow is shown in red and the skull bone in blue. The center image shows the tracks (lines) of regulatory T cells (green) in the brains of T. gondii infected mice. The images in the right panel depict parasite cysts within the retinas of infected mice. Cyst walls are show in red and individual parasites in green. O’Brien, C. A., S. J. Batista, K. M. Still, and T. H. Harris. 2019. IL-10 and ICOS differentially regulate T cell response in the brain during chronic Toxoplasma gondii infection. J Immunol. In press. 2019. Louveau, A., J. Herz, M. Alme, A. Salvador, M. Dong, K. Viar, G. Herod, J. Knopp, J. Setliff, A. Lupi, S. Da Mesquita, E. Frost, A. Gaultier, T. H. Harris, R. Cao, S. Hu, J. R. Lukens, I. Smirnov, C. Overall, G. Oliver, and J. Kipnis. CNS lymphatic drainage and neuroinflammation are regulated by meningeal lymphatic vasculature. Nat Neurosci. 21: 1380-1391, 2018. Ly, T., J. A. Thompson, T. H. Harris, and S. T. Acton. The coupled TuFF-BFF Algorithm for Automatic 3D Segmentation of Microglia. 2018 25th IEEE International Conference on Image Processing (ICIP). 121-125, 2018. Norris, G. T., I. Smirnov, A. J. Filiano, H. Shadowen, K. Cody, J. A. Thompson, T. H. Harris, C. Overall, and J. Kipnis. Neuronal integrity, not activity, drives synaptic material clearance by microglia after CNS injury. J Exp Med. 215 (7): 1789, 2018. O’Brien, C. A., C. Overall, C. Konradt, A. O’Hara Hall, N. W. Hayes, S. Wagage, B. John, D. A. Christian, C. A. Hunter, and T. H. Harris. CD11c-expressing cells affect Treg behavior in the meninges during CNS infection. J Immunol. 198 (10): 4054-4061, 2017. Louveau, A., T. H. Harris, and J. Kipnis. Revisiting the mechanisms of CNS immune privilege. Trends Immunol. 36 (10): 569-577, 2015. Louveau, A., I. Smirnov, T. J. Keyes, J. D. Eccles, S. J. Rouhani, J. D. Peske, N. C. Derecki, D. Castle, J. W. Mandell, K. S. Lee, T. H. Harris, and J. Kipnis. Structural and functional features of central nervous system lymphatics. Nature. 523: 337-341, 2015. Landrith, T. A., T. H. Harris, and E. H. Wilson. Characteristics and critical function of CD8+ T cells in the Toxoplasma-infected brain. Semin Immunopathol. 37 (3): 261-270, 2015. Cronk, J. C., N. C. Derecki, E. Ji, Y. Xu, A. Lampano, I. Smirnov, W. Baker, G. T. Norris, N. Coddington, Y. Wolf, A. L. Klibanov, T. H. Harris, S. Jung, V. Litvak, and J. Kipnis. Mecp2: an unexpected regulator of macrophage gene expression and function. Immunity. 42 (4): 679-691, 2015. Banigan, E. J., T. H. Harris, D. A. Christian. C. A. Hunter, and A. J. Liu. Heterogeneous CD8+ T cell migration in the lymph node in the absence of inflammation revealed by quantitative migration analysis. PLoS Comput. Biol. 11 (2): e1004058, 2015. Butler, N. S., T. H. Harris, and I. Blader. Regulation of immunopathogenesis during Plasmodium and Toxoplasma infections: more parallels than distinctions? Trends Parasitol. 29 (12): 593-602, 2013. Harris, T. H., E. Banigan, D. A. Christian, C. Konradt, E. D. Tait Wojno, K. Norose, E. H. Wilson, B. John, W. Weninger, A. D. Luster, A. Liu, and C. A. Hunter. Generalized Lévy walks and the role of chemokines in migration of effector CD8+ T cells. Nature. 486: 545–548, 2012.